Weapons of destruction that are available in Legends. These are the primary weapons available. 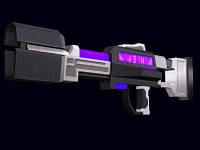 The skin or weapon model may not be the final version. There may be some weapons not listed here as well. Ammo: Fires energy based projectile that causes damage on impact. Can be charged by holding down the trigger to do more damage. Ammo Amount: Unlimited. Uses Player Energy Cell. Comments: The RJ-56a Modulated pistol is a standardized weapon for all players. Ammo: Fires small rounds of superheated plasma bullets. 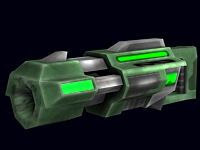 Comments: The IonCannon is best used in groups due to its inaccuracy over long distances, when used in groups it creates a large area of bullets capable of becoming very deadly to a moving target. Damage Type: Direct and Indirect. Medium Radius. Ammo: Fires sharp spinning discs of death that explode on impact.. Comments: The DiscLauncher is a weapon of choice amongst most players. 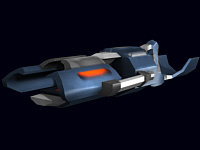 It has a nice rate of fire and the projectiles are fast and can cause both direct and indirect damage. Ammo: Fires canisters of explosive plasma with a timer. 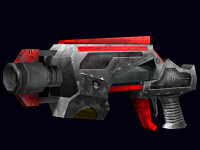 Comments: The GrenadeLauncher is a good weapon because of it's explosive power and damage radius although, there are some drawbacks such as its timed explosion and the fact that it fires in an arc. Ammo: Fires a bullet in a straight line, instantly. Comments: The SI43 RailGun is a sniper weapon. Damage Type: Direct and Indirect. Small Radius. Ammo: Fires large rounds of superheated Plasma. Comments: This weapon is best suited for an indoor enviornment due to it's slow firing rate. Damage Type: Direct and Indirect. Large Radius. Ammo: Fires Canisters of very explosive gas with a short time delay. Comments: Very destructive weapon with a large radius but slow firing rate. 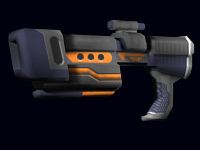 Not to be used as a primary weapon, good for bombardments. 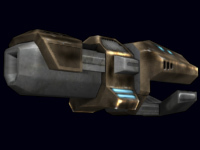 This weapon can only be used by the heavy armor due to it's size and kickback strength.